Habitat: Desert, Upland. 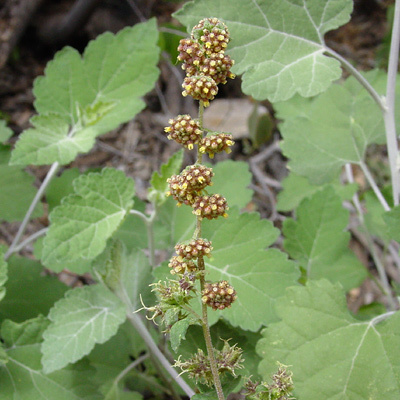 It is usually found in the mountain foothills and in sandy washes. Description: The staminate (male) flower heads are clustered at the tips of long flower spikes, and the pistillate (female) flower heads are clustered below them. The flowers are wind-pollinated and are followed by fuzzy, spiny burs. The leaves are petiolate, mostly alternate, heart-shaped, coarsely toothed and lobed, silver-veined and light green in color above, and densely covered in silvery white hair below. 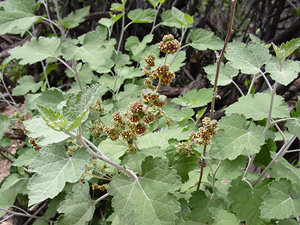 The stems are upright, hairy, and silvery white in color. Allergenic – The male flowers have highly allergenic pollen.